There is nothing more striking than a high contrast quilt. This is when you combine two colors that are vastly different to create a design with very clean lines. You might see color combos like white and red, or white and navy blue. They tend to be bold designs. As beautiful as they are, they do have one design challenge. How do you quilt it? What color thread is going to blend with two colors so in opposition to each other? Deborah had to answer that very question on her extra large star quilt. Deborah’s beautiful quilt is simply a large Star Flower Quilt block that is surrounded with two interlocking square borders. 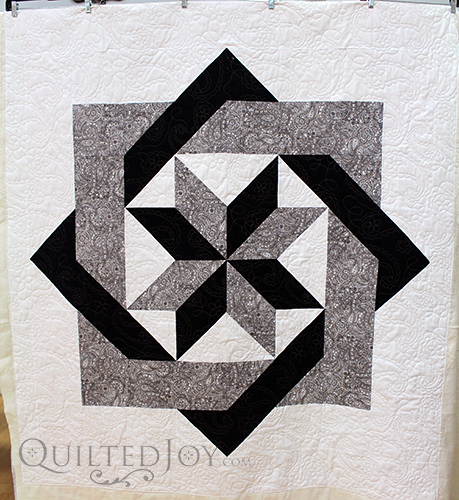 What makes this quilt so striking is the color palette – white, black, and gray. The high contrast between the fabrics make the piecing really stand out. It can also make slight misalignments between the pieces stand out as well. So you can really tell that Deborah did an excellent job making her points match. It looks amazing! But this still leaves the question about what color thread to choose. If she chose black, it blends in beautifully with the paisley gray fabric and the black. But it would be very visible on all that white space around the figures. If she chose gray, it would again blend in with the gray paisley, but be highly visible on the white especially, as well as the black. I’ve noticed that light thread on dark fabric tends to look better than dark thread on light fabric. For this reason, Deborah decided to go with the white. As you can see, the white thread blends in nicely on the white. It blends in nicely with the paisley too, as did the gray and black thread. But it does show off on the black. With this pattern in particular, the white is the background. The black and the paisley are the design that sit on the white background. By choosing white and allowing it to disappear on the background, but read on the black, we are keeping the black and gray the same. They both have visible patterns while the white on white is more subtle. But check out what the quilt looks like from a distance. You can barely see the white thread on the black. There are a lot of beautiful patterns out there that would look amazing with a high contrast color palette. There are also other options on thread choice. Variegated threads can look fun, or a clear monopoly thread can just disappear on every color. Check out this post on how to choose the right color thread for your quilt. Previous post: Who’s Ready for Linda Hrcka’s Machine Quilting Workshops? Next post: Certified Used APQS Longarm Quilting Machines Just Released!